Every year, our church has a small fund-raiser of people building gingerbread houses and selling them to other members of the parish. Each year, this one family makes a virtual work of art. 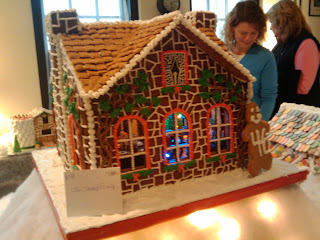 All the furniture and wall decorations and pictures and everything is meticulously made out of gingerbread. And as you can see from the picture, the tree has working lights.